Patients treated in AMIGO often have very large tumors that may have spread to surrounding structures. Image-guided interstitial catheter placement increases the likelihood that the catheters will be properly placed in the center of the tumor, thereby improving radiation dosimetry. The physician is able to see the tumor with much greater accuracy using MRI in AMIGO than is possible with other imaging modalities and it allows direct placement of an interstitial catheter into the tumor and away from the normal tissue, minimizing future toxicity to the patient. In the case of larger tumors that often require insertion of multiple catheters, each area of the tumor can be treated with the appropriate dose. AMIGO, with its unique integration of surgery, PET/CT, MRI, and brachytherapy, offers many possibilities for translational research with the potential for improving patient care for patients with gynecologic tumors. In terms of MRI, AMIGO facilitates assessment of potentially biologically active residual regions of tumors. In the laboratory, biopsied tissue obtained during AMIGO imaging allows correlation between imaging and pathology. The ultimate goal is to use these novel approaches to increase disease-free intervals and minimize long-term toxicities frequently associated with radiation treatment. The workflow shown below is for a patient who was diagnosed using PET/CT and MR with a 0.5 cm mass in the cervix, extending back toward the pelvic side wall. The tumor is fixed at the side wall, causing a hydronephrosis (stage IIIb cervical cancer). On the basis of the images, the patient is an ideal candidate for the AMIGO suite because of the tumor location and the difficulty in accessing the tumor using standard approaches. Initial assessment. The patient is brought into the main operating room and placed in dorsal lithotomy position. The perineum is prepped and draped. A speculum is then inserted to visualize the cervix and the cervical os. A clinical examination is performed. Applicator placement. A catheter is placed in the bladder, clamped, and the bladder filled with 150-200 cc. of saline, allowing a clear ultrasound picture of the intracervical and intrauterine canal. A single stitch at the cervical apex may be placed to pull the cervix towards the surgeon/radiologist to allow easier insertion to ensure that the cervix does not extend into the abdomen. The process of dilating the cervix using serial dilators begins, using an intrauterine sound to measure the length of the intrauterine canal. The required length of the tandem is determined and the applicator is inserted. The tandem holds the radiation seeds; treatment will be delivered later the same day in a shielded for radiation brachytherapy suite. Applicator placement. Following dilation, the tandem is easily inserted and verified through US as in the proper position at the top of the fundus and inside the center of the cervix. An obturator is then placed over the tandem. Applicator placement. The template is then placed. It rests on the surface of the patient’s perineum and is sutured at four corners. Intraoperative Imaging. The patient is brought into the MR room on a MR compatible table top that is unique to the AMIGO suite. She is placed on the AMIGO MR table following transfer and brought through to the back of the 3T MR. A series of MR images are taken to delineate the tumor seen with the tandem in place. Then, a series of interstitial brachytherapy catheters are inserted, directly into the tumor, as seen on the MR.
Intraoperative Imaging. A series of MR images are obtained. Location of the needles is determined on an axial sequence to determine whether it covers the lateral extension to the side wall. Intraoperative Imaging. Additional needles are placed to ensure accurate coverage. A real-time series of approximately 1 minute T2W monitoring catheter sequences is used to confirm adequate placement. Physicians view the scans on the MR imaging screens outside of the room. MR screens inside the MR room confirm the placement of additional insertion, as needed. Intraoperative Imaging. Upon insertion of all the needles and confirmation of adequate placement, a final series of MR images is obtained, allowing the beginning of contouring the tumor volume on the MR. Treatment. The patient is brought to the CT and a quick CT scan obtained for verification of the needle locations. The CT images assist the radiation physicist with digitization of the catheters for radiation treatment planning. Upon completion of treatment planning, the radiation sources are inserted in a dedicated brachytherapy suite in the Department of Radiation Oncology. Robert A. Cormack. 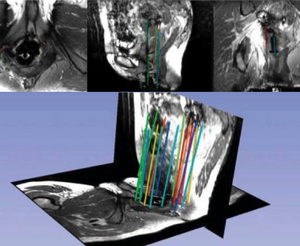 Image-Guided Brachytherapy. Ch.26. Part IV. Image-Guided Therapy Delivery Systems. In Ferenc A. Jolesz (Ed. ), Intraoperative Imaging and Image-Guided Therapy. New York, NY: Springer; 2014. pp. 387-98. PURPOSE: We designed and built dedicated active magnetic resonance (MR)-tracked (MRTR) stylets. We explored the role of MRTR in a prospective clinical trial. METHODS AND MATERIALS: Eleven gynecologic cancer patients underwent MRTR to rapidly optimize interstitial catheter placement. MRTR catheter tip location and orientation were computed and overlaid on images displayed on in-room monitors at rates of 6 to 16 frames per second. Three modes of actively tracked navigation were analyzed: coarse navigation to the approximate region around the tumor; fine-tuning, bringing the stylets to the desired location; and pullback, with MRTR stylets rapidly withdrawn from within the catheters, providing catheter trajectories for radiation treatment planning (RTP). Catheters with conventional stylets were inserted, forming baseline locations. MRTR stylets were substituted, and catheter navigation was performed by a clinician working inside the MRI bore, using monitor feedback. RESULTS: Coarse navigation allowed repositioning of the MRTR catheters tips by 16 mm (mean), relative to baseline, in 14 ± 5 s/catheter (mean ± standard deviation [SD]). The fine-tuning mode repositioned the catheter tips by a further 12 mm, in 24 ± 17 s/catheter. Pullback mode provided catheter trajectories with RTP point resolution of ∼1.5 mm, in 1 to 9 s/catheter. CONCLUSIONS: MRTR-based navigation resulted in rapid and optimal placement of interstitial brachytherapy catheters. Catheters were repositioned compared with the initial insertion without tracking. In pullback mode, catheter trajectories matched computed tomographic precision, enabling their use for RTP. PURPOSE: To compare clinical outcomes of MR-based versus CT-based high-dose-rate interstitial brachytherapy (ISBT) for vaginal recurrence of endometrioid endometrial cancer (EC). METHODS AND MATERIALS: We reviewed 66 patients with vaginal recurrent EC; 18 had MR-based ISBT on a prospective clinical trial and 48 had CT-based treatment. Kaplan-Meier survival modeling was used to generate estimates for local control (LC), disease-free interval (DFI), and overall survival (OS), and multivariate Cox modeling was used to assess prognostic factors. Toxicities were evaluated and compared. RESULTS: Median followup was 33 months (CT 30 months, MR 35 months). Median cumulative equivalent dose in 2-Gy fractions was 75.5 Gy for MR-ISBT and 73.8 Gy for CT-ISBT (p = 0.58). MR patients were older (p = 0.03) and had larger tumor size (>4 cm vs. ≤ 4 cm) compared to CT patients (p = 0.04). For MR-based versus CT-based ISBT, 3-year KM rate for local control was 100% versus 78% (p = 0.04), DFI was 69% versus 55% (p = 0.1), and OS was 63% versus 75% (p = 0.81), respectively. On multivariate analysis, tumor Grade 3 was associated with worse OS (HR 3.57, 95% CI 1.25, 11.36) in a model with MR-ISBT (HR 0.56, 95% CI 0.16, 1.89). Toxicities were not significantly different between the two modalities. CONCLUSION: Despite worse patient prognostic features, MR-ISBT was associated with a significantly better (100%) 3-year local control, comparable survival, and improved DFI rates compared to CT. Toxicities did not differ compared to CT-ISBT patients. Tumor grade contributed as the most significant predictor for survival. Larger prospective studies are needed to assess the impact of MR-ISBT on survival outcomes. PURPOSE: To develop an active MR-tracking system to guide placement of metallic devices for radiation therapy. METHODS: An actively tracked metallic stylet for brachytherapy was constructed by adding printed-circuit micro-coils to a commercial stylet. The coil design was optimized by electromagnetic simulation, and has a radio-frequency lobe pattern extending ∼5 mm beyond the strong B0 inhomogeneity region near the metal surface. An MR-tracking sequence with phase-field dithering was used to overcome residual effects of B0 and B1 inhomogeneities caused by the metal, as well as from inductive coupling to surrounding metallic stylets. The tracking system was integrated with a graphical workstation for real-time visualization. The 3 Tesla MRI catheter-insertion procedures were tested in phantoms and ex vivo animal tissue, and then performed in three patients during interstitial brachytherapy. RESULTS: The tracking system provided high-resolution (0.6 × 0.6 × 0.6 mm(3) ) and rapid (16 to 40 frames per second, with three to one phase-field dithering directions) catheter localization in phantoms, animals, and three gynecologic cancer patients. CONCLUSION: This is the first demonstration of active tracking of the shaft of metallic stylet in MR-guided brachytherapy. It holds the promise of assisting physicians to achieve better targeting and improving outcomes in interstitial brachytherapy. Segmentation of interstitial catheters from MRI needs to be addressed in order for MRI-based brachytherapy treatment planning to become part of the clinical practice of gynecologic cancer radiotherapy. This paper presents a validation study of a novel image-processing method for catheter segmentation. The method extends the distal catheter tip, interactively provided by the physician, to its proximal end, using knowledge of catheter geometry and appearance in MRI sequences. The validation study consisted of comparison of the algorithm results to expert manual segmentations, first on images of a phantom, and then on patient MRI images obtained during MRI-guided insertion of brachytherapy catheters for the treatment of gynecologic cancer. In the phantom experiment, the maximum disagreement between automatic and manual segmentation of the same MRI image, as computed using the Hausdorf distance, was 1.5 mm, which is of the same order as the MR image spatial resolution, while the disagreement between automatic segmentation of MR images and "ground truth", manual segmentation of CT images, was 3.5 mm. The segmentation method was applied to an IRB-approved retrospective database of 10 interstitial brachytherapy patients which included a total of 101 catheters. Compared with manual expert segmentations, the automatic method correctly segmented 93 out of 101 catheters, at an average rate of 0.3 seconds per catheter using a 3 GHz Intel Core i7 computer with 16 GB RAM and running Mac OS X 10.7. These results suggest that the proposed catheter segmentation is both technically and clinically feasible.